The arrival of iPad was a major breakthrough for the Apple Inc. as today the number of iPads sold worldwide is more than a staggering 170 million units which means that for any kind of business the businessman has a customer strength of more than 170 million people around the world for the iPad app he is developing for his business. It is a fact that the iPad users have a track record of more number of online purchases than of any other smartphone users which clearly shows us that an iPad app development will be a very good move for your business. With very good experience in the field of app developing Arthisoft has a very powerful team of iPad app developers always ready to take up any kind of tasks. The designers and the developer team have perfected the skill of creating innovative and intelligent apps for various businesses around the world. 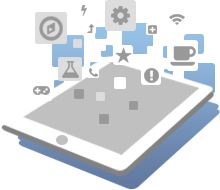 Why choose Arth-I-Soft for iPad Development? Create your own iPad app developed from a highly experienced team of developers at Arth-I-Soft. The attractive design of the apps with lot of different features will make it more fun to use in an iPad. The combination of the creative and technical knowledge by the experienced developers will make the app more easy to use. It will be seen that no form of miscommunication occurs between the client and the developers and the communication will always be maintained with all the sources like phone calls, chats and email from the developer team. The testing of your app will be done in deep so that no form of bug remains unsolved in the app to improve the user experience. The pre tested and prebuilt components of the app will make help in faster development of your app and also faster marketing. The developers are always updates to the latest technologies and tools regarding the iPad app development and also for faster marketing.